There are many things in every culture that are "less visible" because they require people to observe human behavior. Habits, expectations and values are "less visible" because they might not be evident on the surface, yet they shape how people behave in a wide variety of situations. 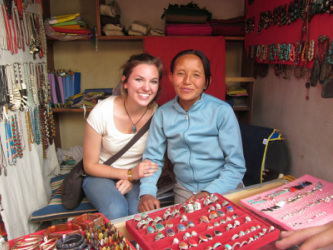 In Preparing to Study Abroad: Learning to Cross Cultures, Steven Duke discusses various aspects of relationships, communication styles, and attitudes toward religion and time that reveal "less visible" elements of culture. For example, interpersonal relationships vary widely across the world and on many dimensions. How individuals fit into their family, clan or social group shape a wide variety of habits and expectations around different elements of hierarchy, power, gender, sexuality, cleanliness, and much more. Communication styles also vary, ranging from very direct cultures (where people say what they think directly, including negative feedback) to indirect cultures (where people imply what they mean but avoid saying "no" directly). Identifying less visible aspects of culture requires observing how people act and behave, and how they interact with others. It also requires asking questions when behaviors, expectations, attitudes and habits seem different than what you might expect. This can be challenging at times, but it can also be fun.